Back in July 2013 my wife and I were in Paris for five days. I took the opportunity to visit and photograph a lot of sites linked with American author Ernest Hemingway. 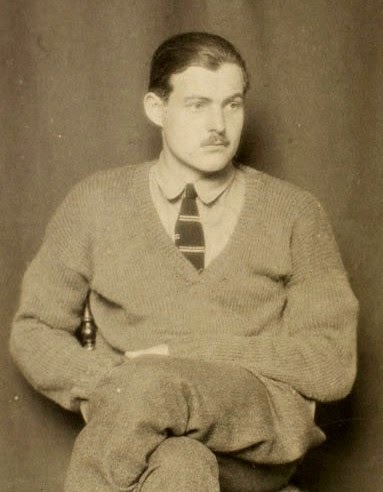 Later I prepared a detailed account of Hemingway's life in Paris up to 1926, when he was still married to Hadley Richardson and living on rue Notre-Dame-des-Champs. I included many of the pictures from that visit. I was back in Paris two months ago during our summer holidays in France. Although I didn't have specific plans to revisit any Ernest Hemingway sites this year, I did get more photos of his apartment at 74 rue du Cardinal Lemoine and also took shots of 6 rue Férou - his home with second wife Pauline Pfeiffer. But then I discovered, after the fact, several interesting coincidences cropping up about the places I had visited and photographed during our stay in Paris this year. 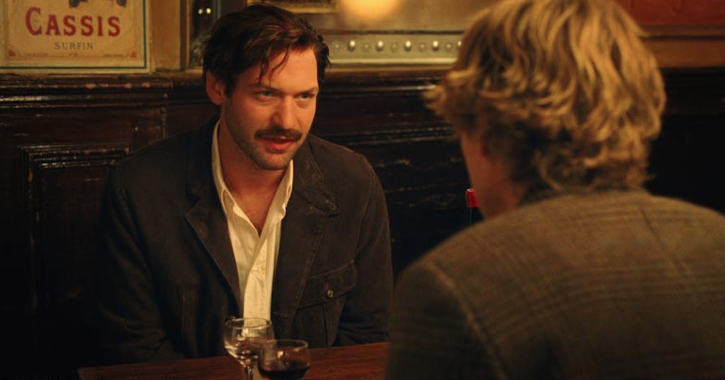 This post, therefore, serves as an addendum to two of my previous blog posts: 'Ernest Hemingway - The Paris Years' (from October, 2013) and 'Woody gets Ernest in "Midnight in Paris" ' (February, 2012). No matter where I go in Paris, it seems, echoes and connections of Hemingway inevitably follow! I dealt with Hemingway's first apartment in detail in a previous blog post. He and wife Hadley moved into 74 rue du Cardinal Lemoine in early 1922. They were living on the eastern edge of the Latin Quarter, just north of the Place Contrescarpe and rue Mouffetard - a rather run-down neighbourhood, but very cheap. 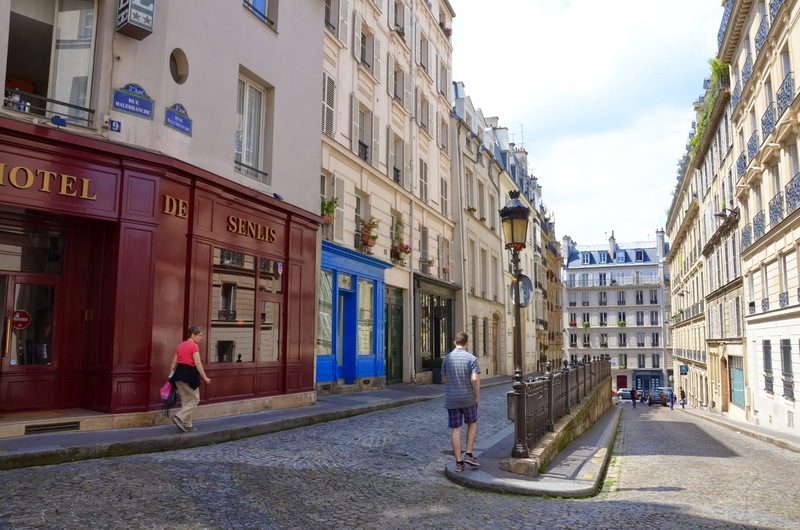 My wife and I went past the place many times in 2013 as we walked to and from our hotel on rue des Écoles to "La Mouffe" (as the locals refer to the Mouffetard area, which is crammed with specialty shops and restaurants). But this July we found an interesting new angle on the place. 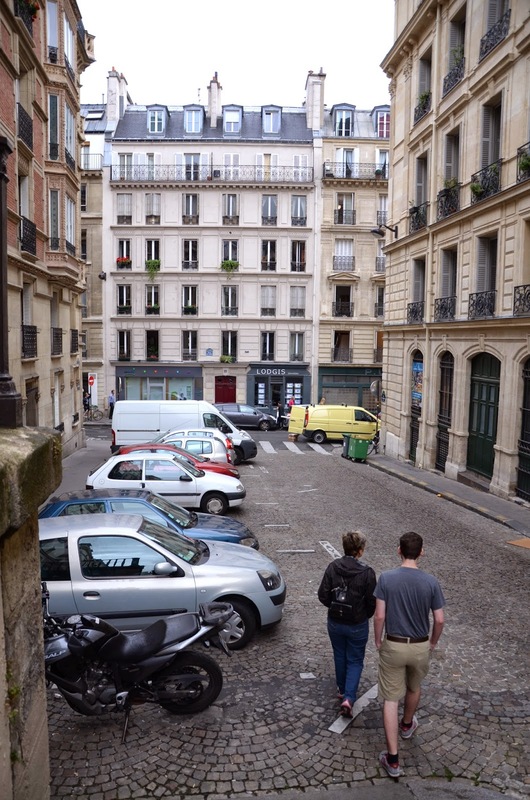 After a visit to the nearby Roman site of Les Arènes de Lutèce, we crossed rue Monge, and took a shortcut back towards the Panthéon, using a narrow side street called rue Rollin. As you walk west towards La Mouffe, the prominent blue door at the entrance to Hemingway's former apartment comes into view - and is framed dramatically as you get closer. When we reached the front door I got my son to pose on the pavement beside it. Hemingway and his first wife Hadley Richardson separated in August, 1926. They had been married for six years. 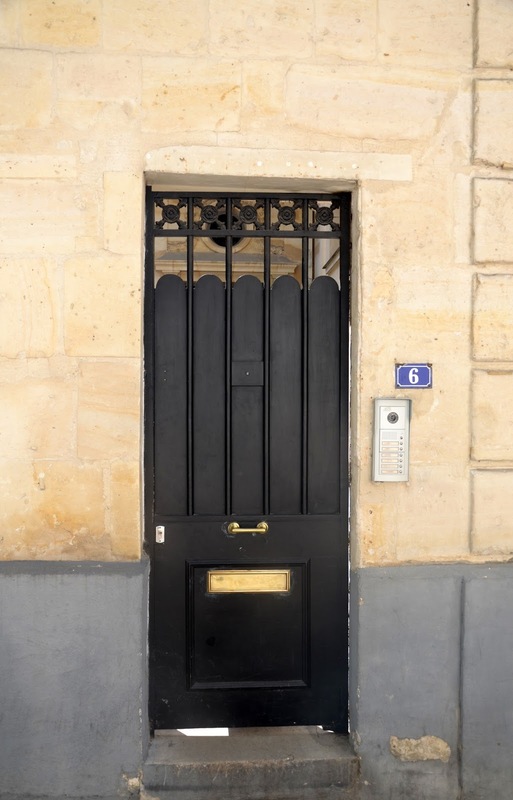 Hadley set up home with son Jack ("Bumby") at 35 rue de Fleurus - near Gertrude Stein's apartment; and Ernest loaned temporarily his friend Gerald Murphy's studio apartment at 69 rue Froidevaux. Hemingway continued to rent their former apartment on rue Notre-Dame-des-Champs for many months, but neither of them could stand to live there any more.. Eventually Pauline Pfeiffer, Ernest's second wife, found them a very comfortable place in the same area of Paris - with the help of Ada MacLeish, the wife of Ernest's poet-friend Archibald MacLeish. 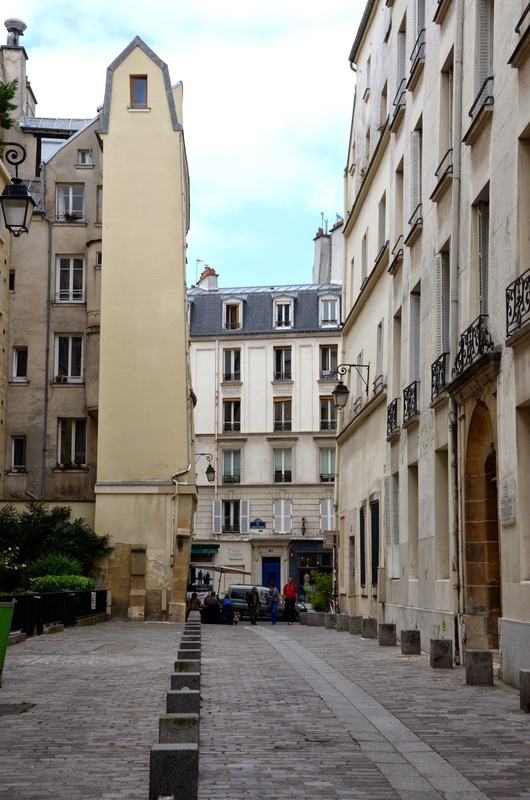 It was situated at 6 rue Férou, a quiet, cobbled, side-street running between the Luxembourg Gardens and Place Saint-Sulpice. They signed a three-year lease for only 9,000 francs per year. The place was only 50 francs more per month than the cold-water flat on rue Notre-Dame-des-Champs, and it proved to be a huge improvement in size, comfort, and modern conveniences. It came with a garden courtyard, a large master bedroom and salon, two small rooms, a dining room, kitchen, bathroom and two toilets. And heat! The apartment was also open to the front and back of the building, so it got both morning and evening sunlight. 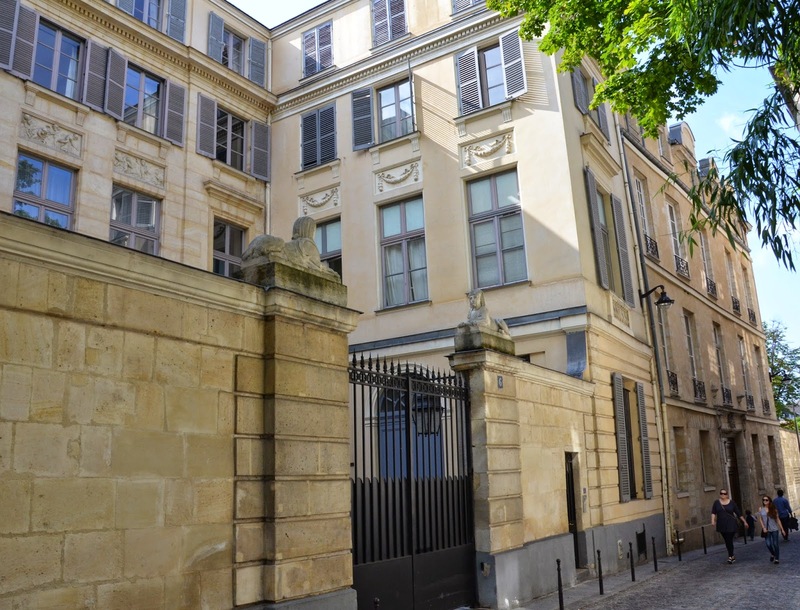 It was a huge improvement on his previous Parisian residences - indicative of the financial stability brought by his marriage into the Pfeiffer family. 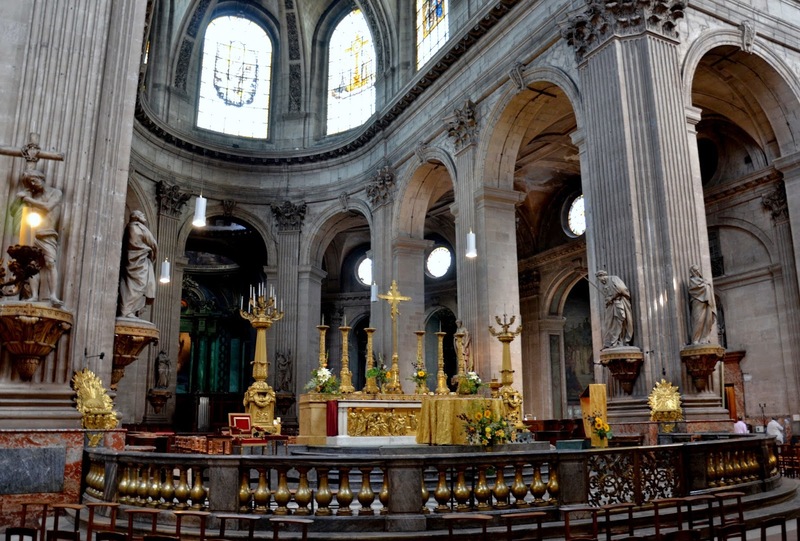 From their door on rue Férou, Ernest and Pauline were only about 150 metres from the Church of Saint-Sulpice. Turn left and it's a brief three-minute walk. They used it as their parish church. 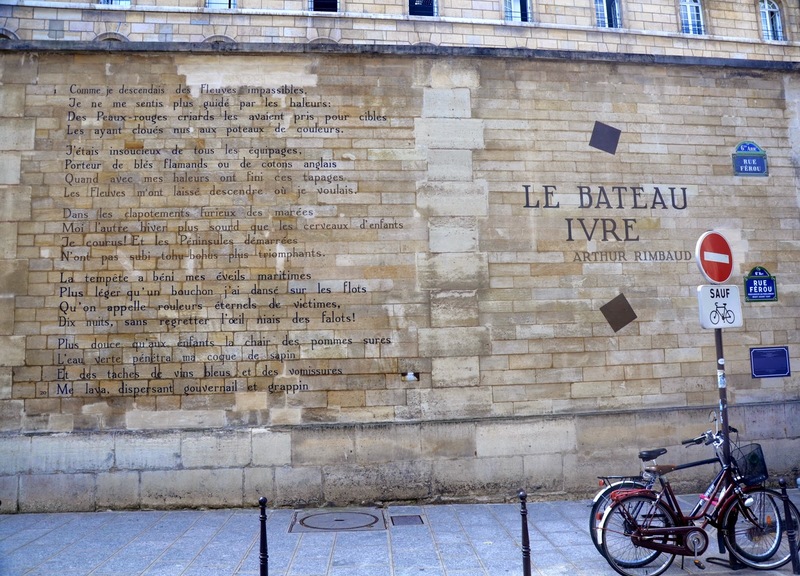 The Rimbaud wall poem - "Le bateau ivre"
As you walk north along rue Férou, beyond the former Hemingway apartment at #6, you soon reach a long stretch of wall that has been decorated with the entire text of "Le bateau ivre", one of Arthur Rimbaud's first important works. He wrote it 1871, at the age of sixteen. When he came to Paris that year, he read the 100-line verse-poem out loud one evening at a dinner of the Villains Bonshommes. This was a recently-formed society of like-minded artists and writers who met for dinners about once a month, to discuss their work and their literary theories. Rimbaud was introduced to the group by his new friend Paul Verlaine. 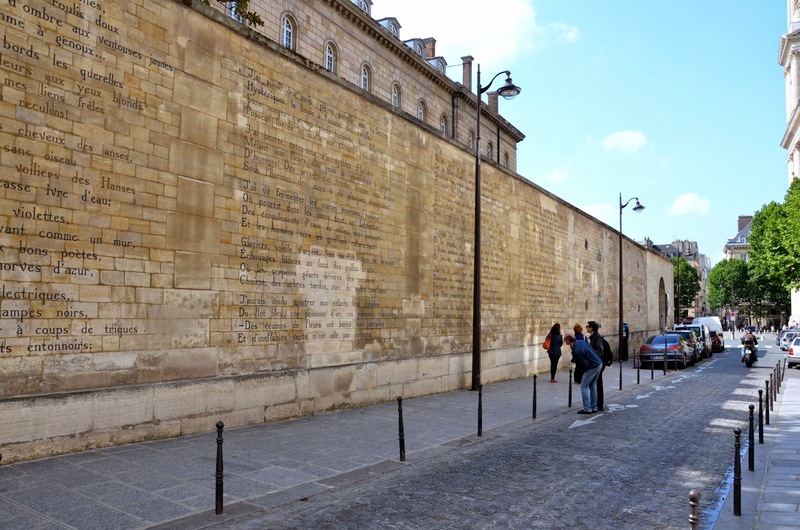 Rimbaud's recitation of the poem in the restaurant Denogeant, on the Place Saint-Sulpice - just a couple of hundred metres away from this wall on rue Ferou - created quite a stir. "Le bateau ivre" was the first mural poem created outside the Netherlands. The project Poems on Walls started there in 1992 in the town of Leiden. This mural poem in Paris was painted by Dutch artist Jan Willem Bruins and unveiled in June 2012. 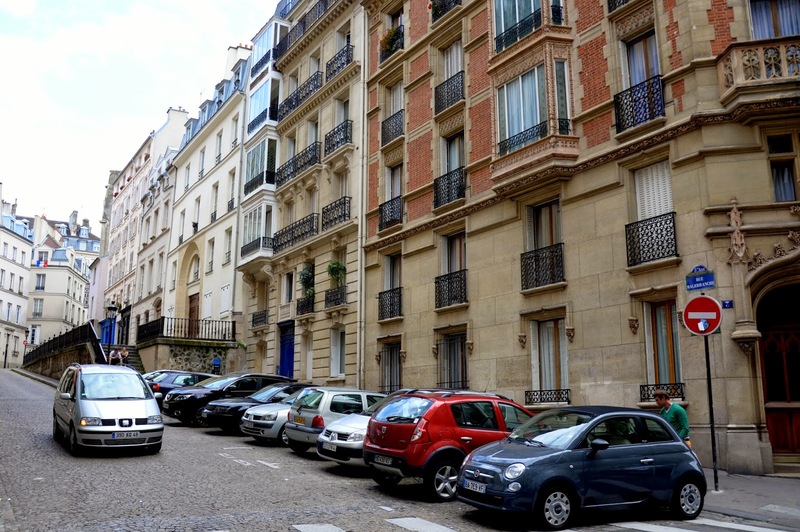 For our visit to Paris this summer, instead of staying in a hotel, we rented an apartment that we found on the internet. 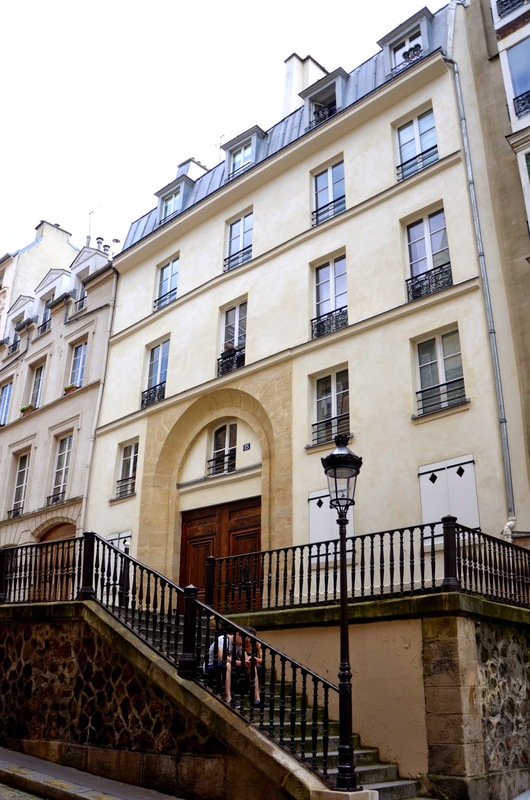 It was located at 15 rue Malbranche, one block away from rue Soufflot, a main street which runs between the Luxembourg Gardens and the Panthéon. 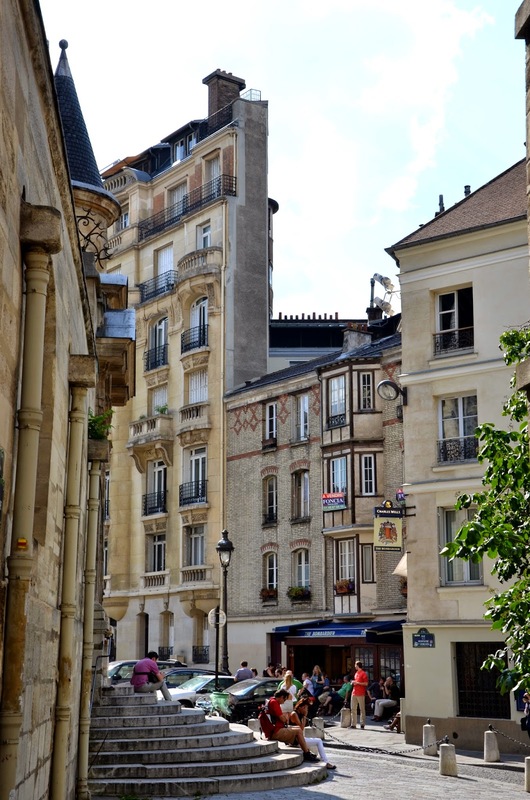 Our apartment was centrally located in the Latin Quarter, and proved to be a quiet spot - surrounded by other residences. No cafés, restaurant or bars. Rue Malbranche turned out to be a unique looking side-street. It has two levels separated by a wall. There are steps at one end, near the door leading into our apartment complex; these steps provide access from one level of the street to the other. 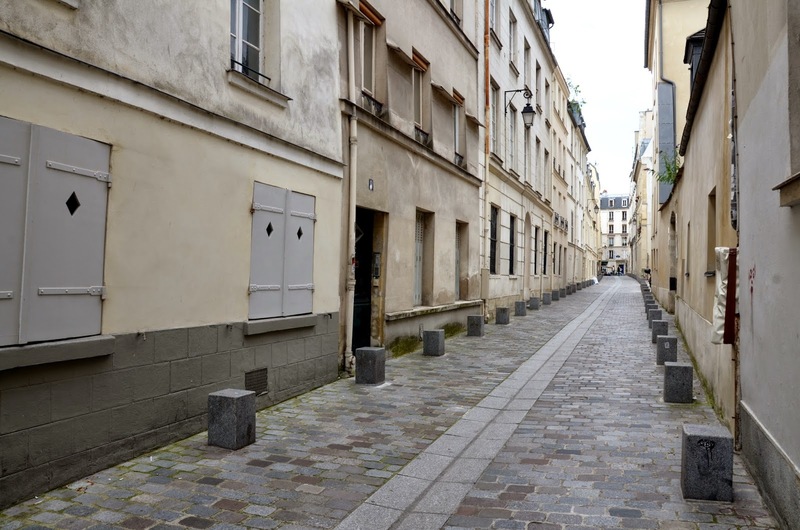 Rue Malebranche is just a short stretch, running between rue Saint-Jacques and rue Le Goff. It was created in 1646 - eventually named after philosopher Father Nicolas Malebranche back in 1877. Back here in Canada I discovered that the interesting look of rue Malebranche has attracted the attention of several film directors. 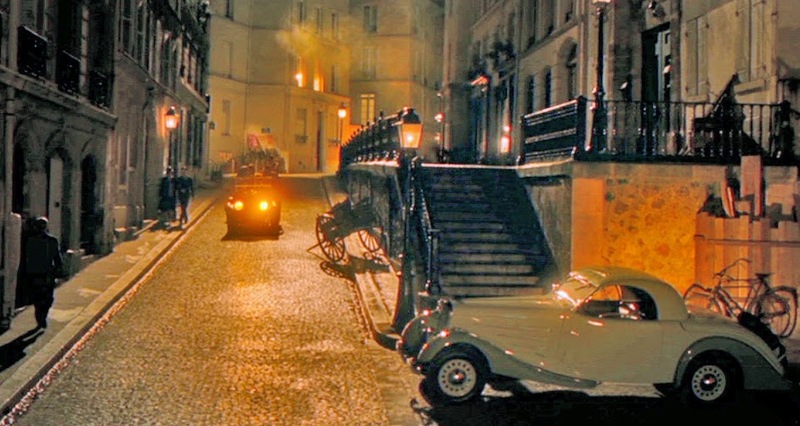 Billy Wilder used 17 rue Malebranche as the location for the apartment of the father-and-daughter characters played by Maurice Chevalier and Audrey Hepburn in his film Love in the Afternoon (1957). 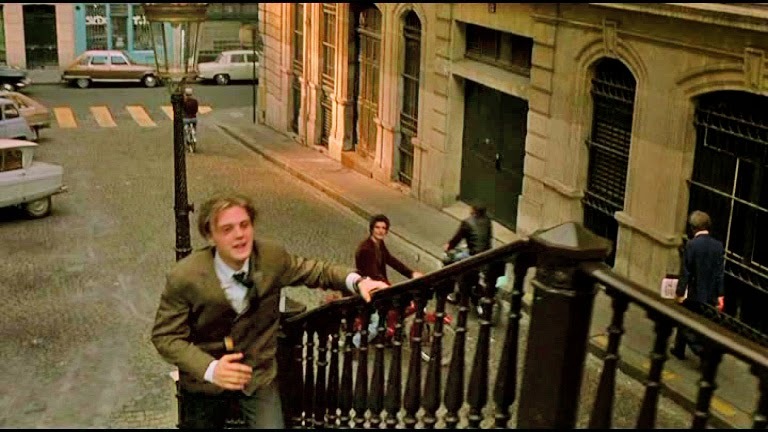 Bernardo Bertolucci used the Hotel de Senlis, on the other end of the street, at #9, as the home of one of his lead characters in The Dreamers (2003). 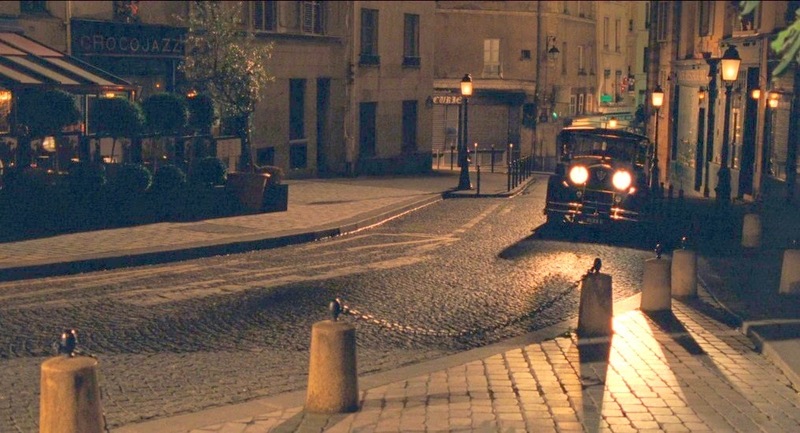 And in Woody Allen's Midnight in Paris (2011) 17 rue Malebranche is used yet again. After Allen's protagonist in Midnight in Paris (Gil Pender) meets Scott and Zelda Fitzgerald and Cole Porter at a Jean Cocteau party in 1920s Paris, they decide to move on to "Bricktop's". This was a popular nightclub run at Le Grand Duc by Ada Smith. The real "Bricktop's" was located at 52 rue Pigalle up in Montmartre. 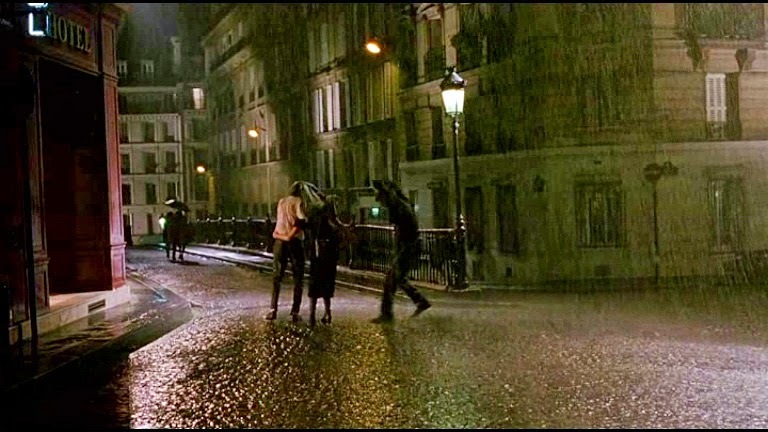 In Woody Allen's film it is set at 17 rue Malbranche. 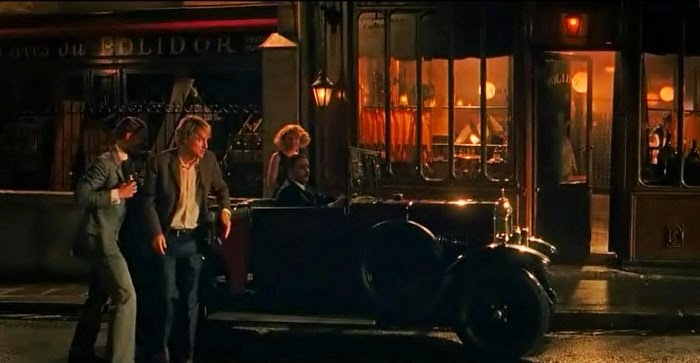 There is a brief, atmospheric scene in the film showing the tipsy crew of late-night revelers coming down the street in a 1920 Peugeot Landaulet. Ada Smith ("Bricktop") lived into the 1980s - she is a featured as a "talking head" in Woody Allen's intriguing film Zelig (1983). When in France, this year and last, Barb and I drank a lot of white wine - going out of our way to sample bottles from many of the key regions: the Loire Valley, Chablis, Burgundy, Bordeaux, Alsace, Languedoc-Rousillon, Savoy, and the Rhône Valley. But once in a while, I would hanker for a pint of ale. So I looked for a place in, or near, the Latin Quarter. I found a couple of interesting spots. The first was called Brewberry's. It's more like a wine bar, than a pub. It doesn't have any beer on tap; instead, it has a wide variety of bottled beers from all over the world - specializing in ale from Belgium and lager from Germany. It's a small establishment, with five or six small tables inside, and some tables set outside - in typical Parisian-fashion - on the pavement. In addition to the beer, they serve snacks and "finger-food" - what the Greeks would refer to as mezes. Brewberry is located just off rue Mouffetard at 18 rue de Pot de Fer. I sat at the counter near the back of the place chatting with Cécile Delorme, the proprietor. I mentioned to her, in passing, that George Orwell had lived in an apartment just down the same street at #6. He lived in the Latin Quarter in 1928-1929 and worked as a dishwasher (plongeur) at a prominent hotel. He described his experiences later in his first book, Down and Out in Paris and London (1933). The other place I found for good beer in the Latin Quarter was The Bombardier, an English pub with lots of beer on tap - specializing in ale brewed by the Wells and Young's Company. Bombardier is a particularly fine dark ale created by Wells. I discovered this pub in 2013, and dropped in a couple of times to enjoy a pint whilst writing a few postcards. So, when I was planning ahead this spring for a likely pub or tavern in which to watch the two World Cup semi-finals that would take place whilst we were in Paris, I knew where to go! I wasn't disappointed. 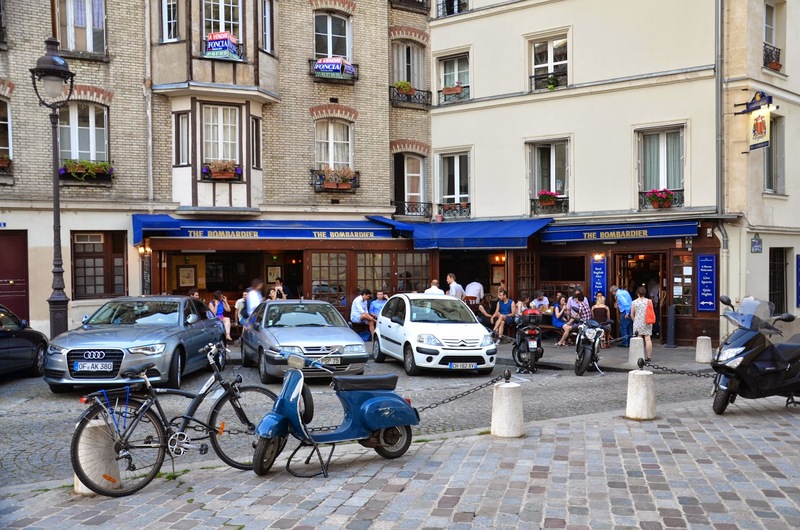 The Bombardier Pub is in a wonderful location - the north-east corner of the Place du Panthéon. As you come up rue Soufflot towards the Panthéon, go left, past the north side. Ahead of you is the impressive Saint-Étienne-du-Mont, built in the sixteenth and seventeenth centuries. When you pass The Bombardier, and bend left to head downhill, the road changes from Place du Panthéon to rue de la Montagne Sainte Geneviève. Where these two thoroughfares meet, at the north-west corner of the church, there is a small set of stone steps leading up to a side door at the front of the church. If the Bombardier Pub is particularly hot and crowded - as it often is during the summer - you can step outside with your pint, and cross the street to these steps. They're only about twenty metres away. A cool spot to sit with your beer in the late evening breeze. 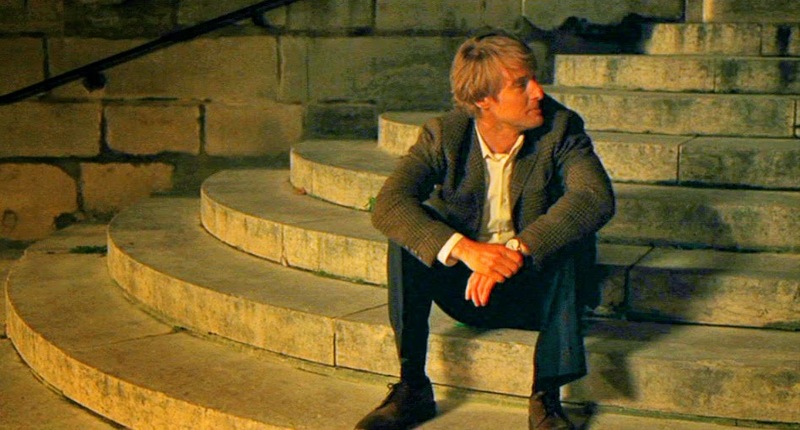 When the protagonist (Gil Pender) of Woody Allen's film Midnight in Paris gets lost by himself late one night, we see him stop for a moment and sit on a set of stone steps. That scene was shot right here beside The Bombardier. When a church bell rings midnight - the camera doesn't shift up and show the church at all - a 1920 Peugeot Landaulet emerges out of the darkness of rue de la Montagne Saint Genevieve and stops. A passenger gets out and entices Gil to join them inside. Soon he is off and away, travelling back in time to 1920s Paris - home of Fitzgerald, Picasso, Dali, Stein and Hemingway. Gil being enticed back to 1920s Paris! On our last evening in Paris I was considering where we might go for dinner. I had nothing in mind, so I thought I'd check Rick Steves' travel guide to France - to see if he had any suggestions for some place interesting nearby. 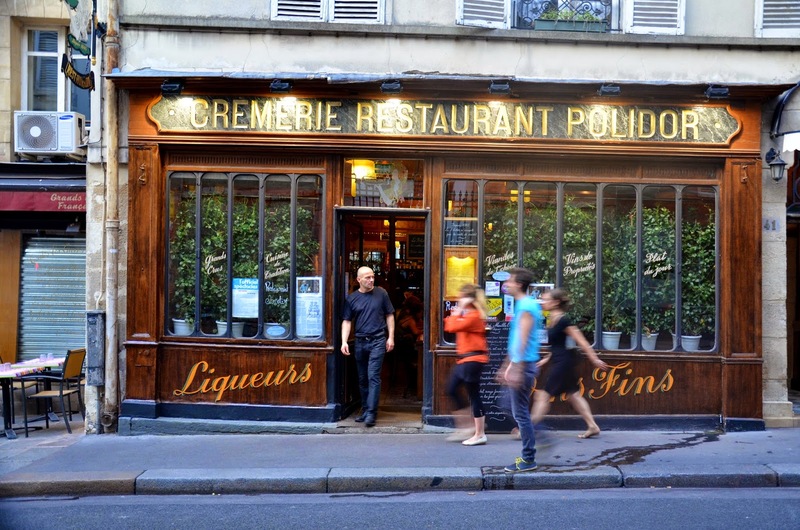 He mentioned Le Restaurant Polidor on rue Monsieur-le-Prince, near the north end of the Luxembourg gardens - about a fifteen minute walk down rue des Ecoles, crossing Boulevard Saint Michel. He writes: "A bare-bones neighbourhood fixture since 1845, is much loved for its unpretentious quality cooking, fun old-Paris atmosphere, and fair value. Stepping inside, you know this is a winner - noisy, happy diners sit tightly at shared tables as waiters chop and serve fresh bread." Sounded good to me, and Barbara agreed. Off we went. 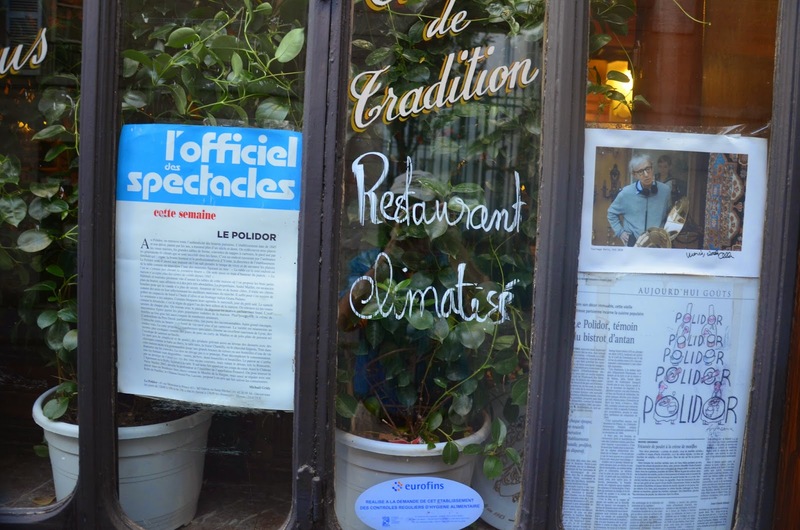 At the front door of the restaurant, I noticed a newspaper clipping taped to the inside of the window. It included a photograph of Woody Allen. I didn't have time to examine the text of the article; we stepped inside for dinner. During the meal that clipping was on mind. "I wonder if Woody Allen ate here regularly when he was directing Midnight in Paris", I said to Barb; "Or maybe he shot a scene right in this restaurant?" I noticed the manager step outside several times to the sidewalk. Perhaps she was enjoying a cigarette - or getting some fresh air? As we left the restaurant later, after a very satisfying meal, there she was at the entrance. I took the opportunity to ask her what the Woody Allen connection was. Indeed, he had shot a scene inside the Polidor, she confirmed - and, yes, he'd enjoyed a few meals there too. 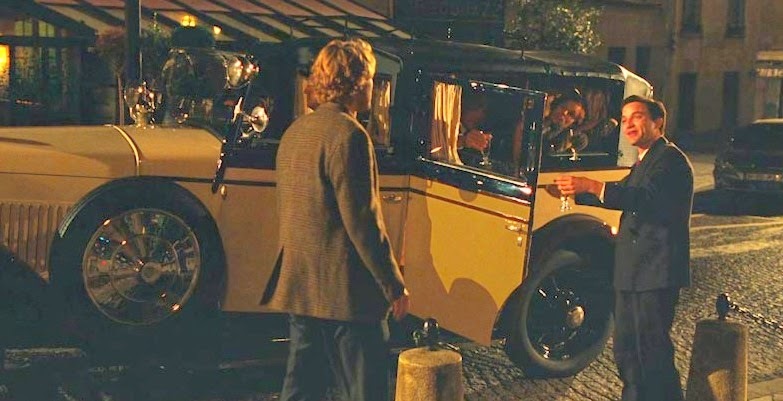 When I got back to Canada, I watched Midnight in Paris again. There's the scene of Gil Pender sitting on the steps next to The Bombardier. You can't see the Pub; it's just out of the shot. But you do see La Capannina Restaurant next door. 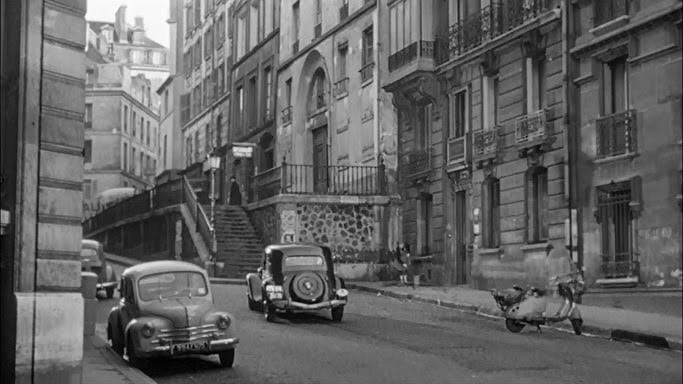 And there's the scene of the revellers in the Peugeot car on rue Malebranche arriving at Bricktop's. Ah ... there's Restaurant Polidor. After some time at Bricktop's - lots of dancing and alcohol - the party continues on into the night at the Polidor. And it is here that Gil meets Ernest Hemingway: "You liked my book? ", Ernest asks. "Liked?" Gil responds, "I loved all of your work." "Yes", Hemingway says, "It was a good book because it was an honest book, and that's what war does to men. And there's nothing fine and noble about dying in the mud unless you die gracefully. And then it's not only noble but brave." Over the top intensity from Hem. Hilarious! A couple more coincidences to finish with. 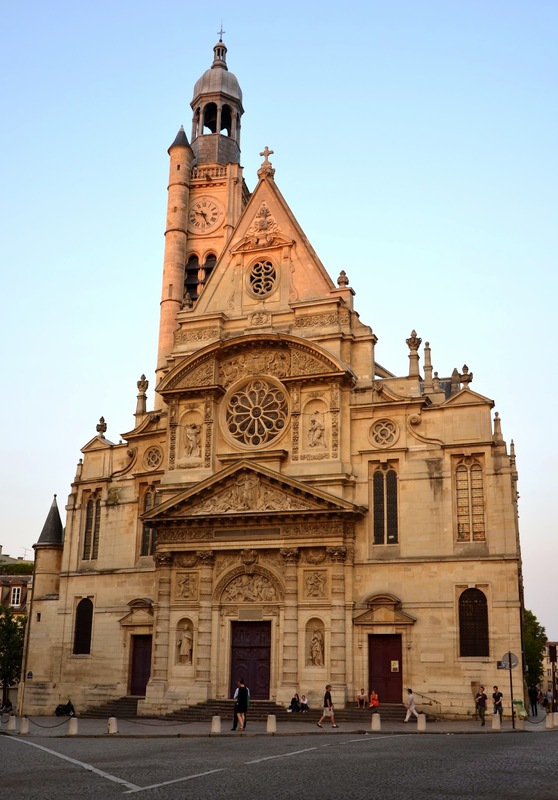 When we were in Dijon, in central France, we went to visit the Saint Michel Church on rue Vaillant. Nearby we accidentally discovered the Musée Rude - a museum dedicated to the work of Dijon artist François Rude. The museum was established in 1947 in the transept of the ruins of the Church of Saint-Etienne. Inside are a collection of casts of many famous sculptures by Rude - including a cast of The Marseillaise, his magnificent bas-relief on the eastern facade of the Arc de Triomphe. Amongst the other casts in the museum is one of Marshall Michel Ney. 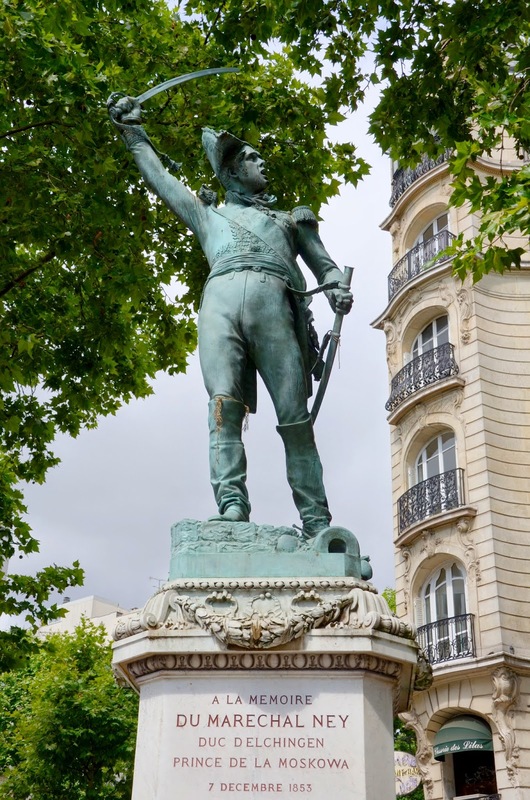 The completed statue is found at the intersection of Boulevard Saint-Michel and Boulevard du Montparnasse in Paris. It is mentioned with admiration by Hemingway in his Paris memoir A Moveable Feast. 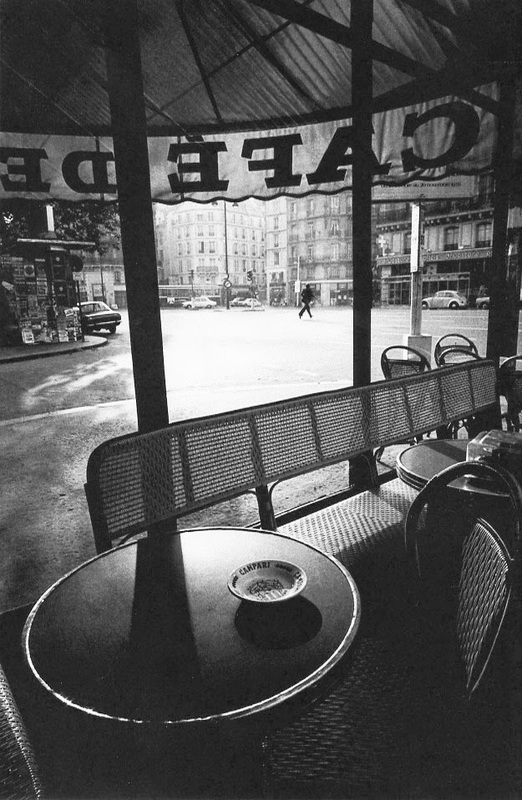 He would gaze at it from his seat in La Closerie des Lilas, his favourite cafe when he was living nearby on rue Notre-Dame-des-Champs. I talk about it in my previous blog post about Hemingway in Paris. Finally, in that same blog post from last year, I included a photograph of Barbara sitting in the Café de Flore on Boulevard Saint-Germain. 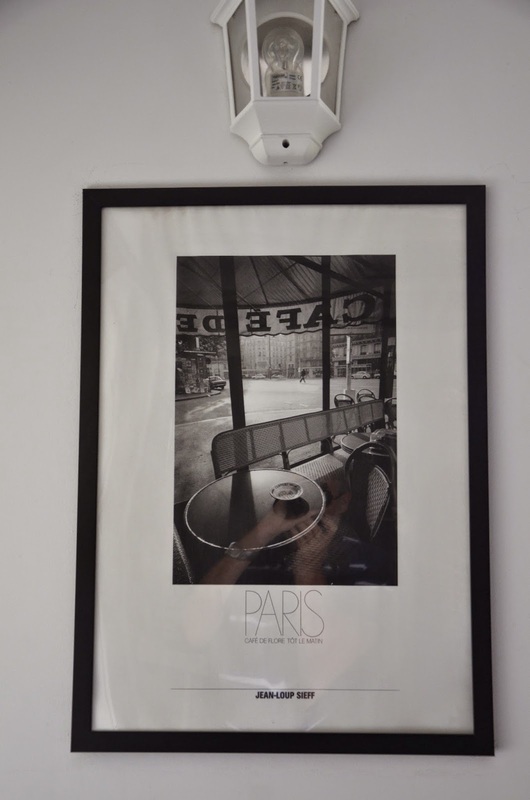 On the wall of our apartment at 15 rue Malebranche was a black-and-white photograph by famed French photographer Jean-Loup Sieff. It's a picture taken from inside the Café de Flore from exactly the same angle! Resource: Hemingway: The Homecoming by Michael Reynolds (the third volume of his five-part biography of Ernest Hemingway). Superb.